Today is Opening Day for much of the major leagues. The Rays open their season tomorrow. Here’s a quick look at two players we have seen a lot of over the last few years. Dan Johnson and Elliot Johnson showed up in Durham Bulls uniforms in 2010 essentially with their last shot at playing serious baseball. Here we are in 2011 and both of them are on the Opening Day roster for the Tampa Bay Rays. How cool is that? Dan Johnson spent virtually all of 2008 and 2010 with the Durham Bulls. His bat (and infielder’s skills) had a lot to do with the Bulls winning the South Division championship in those years. Some grumblers in the stands might point out that his absence (he was called up to Tampa both Septembers) had a lot to do with Durham not winning the Governors’ Cup in those years. Nevertheless, we could never quite figure out last year why Dan wasn’t called up earlier. And we are really, really pleased to see him on the Rays roster this year. Good article by John Romano of the St. Petersburg Times here. And then there’s the other Johnson, Elliot. Over in our side of the stands a couple of years ago, there was a good bit of debate regarding young Mr. Johnson. I represented the skeptics while those a few seats down provided a full-throated harmonious shout of, “Elliot! Get a hit!” In Elliot’s defense, at the time he was playing second base while superstar-in-waiting B.J. Upton was at shortstop and fumbling many, many, many of his opportunities to make a play. Sometimes Elliot would get a hit, as in the game in Norfolk (at least I think it was Norfolk) when he got home runs batting left handed and right handed. The Elliot Johnson who showed up with the Bulls in 2010 after being passed through waivers was a different sort of ballplayer. He and the Bulls were better for it. He had a solid year at the plate, stole a ton of bases, hit for average, was an International League All-Star, and, mostly, avoided injury. In a recent interview he credits his success in 2010 with laying off trying to hit home runs. But even after his successful year, he went into minor league free agency and was off to winter league ball in Mexico (amusingly chronicled in his wife’s blog). To my pleased surprise, he was signed with an invitation to spring training this winter. And he’s on the opening day roster after a terrific spring playing a lot of positions. Couldn’t happen to a nicer guy. Have a great year guys! You’ve worked for it! Stop by and visit the DBAP some day. The Tampa Bay Rays play their first game of the season on April 1, so they have cleaned out their roster with several moves over the last week or so. The seven players sent off the other day were probably just about the end of it. They have appeared to have settled on a 25-man roster of 13 pitchers and 12 position players. 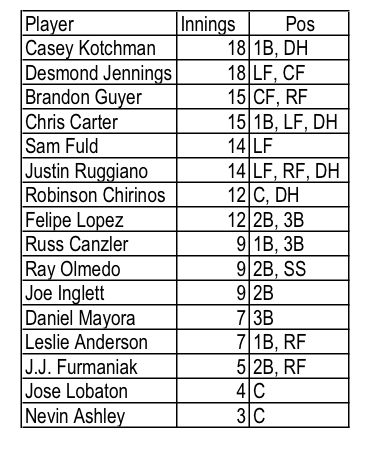 We can’t expect an official Durham Bulls roster, however, until about 7:00 pm on April 7. That is, just prior to the start of the game against Gwinnett that evening. Obviously one more catcher than we need, but the Bulls have carried three catchers in the past. If someone is to go off to Montgomery, my guess it would be Ashley. The list is short one pitcher and I don't have a good enough memory to pick a fifth starter from the full minor league roster. Any suggestions? I'm pretty sure that a couple of the guys on this list have opt out contracts (e.g., Bootcheck), so could be movement on this list before the start of the season. And this is one more than the Bulls usually carry. But, we'll see. I'm not comfortable with this list at all. Yes, we've seen Ray Olmedo and Omar Luna in recent years, but we simply don't have enough information to judge if they are going to end up on the Bulls roster or not. 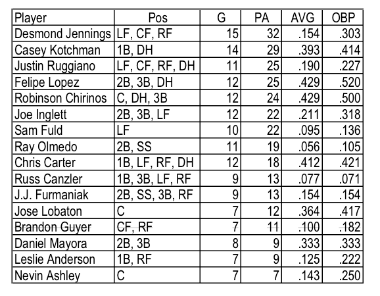 Note that at least three players — Kotchman, Carter, and Anderson (below) — have some first base credentials. Want a real difference for this year? For the first time in my memory, with the exception of Chris Carter, we don't have a reliable home run hitter in the bunch. Carter hit 31 last year for Sacramento in the PCL, but that's it. The rest of the outfield are, at best, doubles hitters. Pretty quick and fleet of foot, I'll grant that, but 15 homers or so is about all that we can expect of any of the outfielders. Last year's Durham Bulls hit 142 home runs. Don't expect anything like that this year. Not as many new guys as I expected at the end of last season. On this list there are only five position players we haven't seen and we've seen most of the starters. This list could be off by quite a bit. It's entirely possible that one or two are already working out with the Biscuits and players we haven't heard about are working out with the Bulls. I've made three substantive changes since I started writing this up on March 27. Two possibilities not mentioned so far are Russ Canzler and Daniel Mayora, both new to the Rays system. For others who may be as obsessed as I am, keep an eye on Stacy Long's blog entries and stories in the Montgomery Advertiser this week. As a side note, I am pleased to report that Jason Cromer has signed on with the Atlantic League Somerset Patriots. Jason was a key member of the 2009 Bulls, but struggled with some kind of arm problem last year. Here's hoping he's over it and good luck. Thanks to Rays Prospects for chasing that down. Update: I chased down the wrong Chris Carter. "Our" Chris Carter spent most of last year with the Mets and with Buffalo of the IL. Almost all of his playing time was in the outfield and he only hit 4 home runs in the majors and 6 in AAA. So he's not going to help out with the home run problem. Also, I've added as a starting pitcher signing I missed: Edgar Gonzalez. Solid stats in Triple A and fair stats with Arizona and Oakland. The season opens soon and I'm thinking that some fans will be looking around the web for information about the Durham Bulls. So here’s WDBB's contribution. I hope that it doesn't come off as too basic. This is mostly stuff I didn't know when I became a Bulls fan. In the very remote chance that I might be in error, I hope that readers will set me straight and I’ll fix it as soon as I can. The Durham Bulls are the Triple-A franchise of the Tampa Bay Rays. Triple-A baseball is one step below major league baseball. How do we know that? Because Major League Baseball says it is. But, hey, it’s baseball, so there will inevitably be a few quirks in the system. The Marlins, Brewers, and Cubs affiliates are all in the Pacific Coast League. The 14 teams in the International League are matched up with major league teams without regard to whether the parent club is in the National League or the American League. The IL has teams affiliated with Boston, New York (Yankees and Mets), Philadelphia, Baltimore, Washington, Atlanta, Tampa Bay, Pittsburgh, Cleveland, Cincinnati, Detroit, Chicago (White Sox), and Minnesota. That gives the IL 8 American League and 6 National League affiliates. Logic would say that since AAA is the next step down from the majors, the teams would like to be in close proximity to each other. Sometimes that’s true. Toledo is linked to Detroit, Pawtucket is the AAA team of Boston, and the Atlanta Braves AAA club is just a long taxi ride away in Lawrenceville, Georgia. On the other hand, Charlotte is pretty far from Chicago and the Durham/Tampa Bay distance is a good bit more than average. Obviously all the teams in the “International” League are in the US, but up until recently there was a team in Ottawa. That gave us the chance to sing along to “O, Canada” four times a year. You can bet that someday — maybe not in my lifetime, but someday — The IL will have a team in Havana, San Juan, or Mexico City. With teams from both the National and American Leagues, what about the designated hitter rule? In the International League the only time pitchers bat is when both clubs are National League affiliates. That means that no Durham Bull pitchers will go to the plate this year (except in the very weird circumstance where a pitcher could go to the plate as a pinch-hitter — not likely, but possible). The league offices are in Dublin, Ohio. Not quite sure what it means, but the Bulls have one seat on the Board of Directors (Bulls VP George Habel). They, of course, have a website. The International League schedules 144 games for each of its teams. Half of those games are played at home. So, unless you are truly a Durham Bulls fanatic, you will only have 72 chances to see your Bulls during the regular season.In 2011 the first home game (April 14) is seven days after the start of the season and the last home game (August 30) is six days before the end of the season. So, unless the Bulls get into the playoffs again, Durham fans have a short season this year. Another very important feature of the schedule is that the Bulls only have one four-day home stand with teams outside the South Division. So, if you are a Boston fan the only chance you’ll get to see Red Sox prospects will be June 3 thru June 6. That’s it. They won’t be back unless we are both in the playoffs in September. The same is true if you’re a Yankees fan (June 24-27), or a Reds fan (May 17-20), or a fan of any of the other parent clubs of teams in the North or West divisions of the International League. Said another way, the Bulls play 40 games at home with the teams from outside the South Division. On the other hand, if you’re a Braves (Gwinnett) or White Sox (Charlotte) or Orioles (Norfolk) fan, you’re in luck. They will be here about a dozen times each this year. As a general rule Bulls home stands lasts eight days and road trips eight days. But not always. In late April, July, and August this year the Bulls have extended road trips. Triple-A ballplayers have a much more relentless schedule than the majors. They play more games with fewer days off, at least until September. The Triple-A All-Star Game pitting the International League All-Stars against the Pacific Coast League All-Stars is set for July 13, 2011 and will be played at the ballpark of the Salt Lake Bees. Exactly how the players are selected for the game is something of a mystery. Fans do get a vote; however, usually the IL doesn't bother to tell us how the voting went. The International League Championship (The Governors’ Cup) is decided with two rounds of best of five playoffs in September. A one-game “AAA Championship” game is to be played on September 20, 2011 in Albuquerque, NM. The Durham Bulls, as all readers of this blog must know, won the Governors’ Cup and the AAA Championship in 2009 and has won the Southern Division of the International League for the last several years. And now, sigh, we need to spend some time discussing the Tampa Bay Rays. First of all, the Tampa Bay Rays play baseball in St. Petersburg, Florida, not Tampa. That may come as a bit of a surprise to those not familiar with Florida geography (or modern marketing strategies). To continue, every major league team consists of 25 players on the "active" roster and another 15 are listed to make up a 40-man roster. In general, once a player makes it to the 25-man active roster he stays there (unless traded or sold). For players who have been around for a while, there are all sorts of byzantine rules regarding how this works. What matters to Bulls fans, however, is that a Bull cannot be called up to play in a Rays game unless he is first on the 40-man roster. Here in Durham, we are not much interested in the active roster. What matters to Bulls fans are those 15 ballplayers who are on the Rays 40-man but not on the active roster. Members of that 15 man group usually make up the heart of the Durham Bulls. If previous years are typical, we can expect that 10 or 11 of the players on the 40-man will be assigned to Durham and they will probably be split about 75/25 pitchers/position players. Of the pitchers, one or two will be prospective starting pitchers, the other potential relievers. Why are they in Durham? Lots of reasons. And that’s one of the pleasures of watching AAA ball. Why is this guy here? When will he be called up? Will he be called up? The odds of being called up are pretty good. There are enough injuries and trades in a given year that most if not all of the players on the 40-man will at least get a few days with the Rays. Some may even go there and stay. What about the Bulls who aren’t on the 40-man? Well, there’s the problem. Unless Tampa Bay takes someone off the 40-man, they can’t be called up. Adjustment to the 40-man can, and does, happen, but not very often. 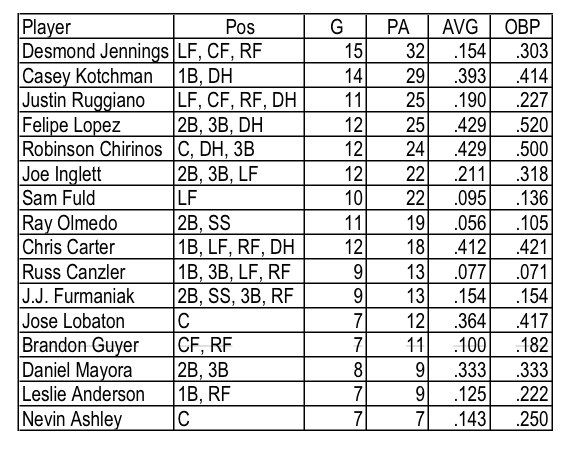 So, the 40-man roster has a lot to do with who plays on the Durham Bulls. It also has an effect on how they play. For example, pitchers may be on defined pitch counts and/or working on specific pitches that the Rays have decided the pitcher needs to develop. Relievers may be tested to see if they can do two days in a row, or “tried out” as a closer. We will see infielders playing the outfield (and vice versa). Some position players may be under orders to become a switch hitter. My point is that sometimes what we see on the field is decided in St. Petersburg, not Durham. The Rays really aren’t particularly interested in the Bulls' won-loss record. So, we will inevitably see some unfortunate (for the Bulls) decisions, such as a player being called up, sitting on the Rays’ bench for a couple of weeks, then coming back to Durham with his timing shot and struggling at bat. Nevertheless, we cannot avoid the fact that the Durham Bulls live and die at the whim of the Tampa Bay Rays front office. What’s fortunate for Bulls fans is that the Rays have invested a ton of effort into building a steady stream of talent to feed into the big team. More than that, very few just “pass through” AAA-level ball. This is a real testing ground for pitchers and hitters. So we may get to see a lot of them. Furthermore, we have a first rate managing/coaching crew with the team. For Durham Bulls history, check out the Bulls web page and the Wikipedia page, which is pretty much up to date. Baseball is good for the soul. I’m guessing you wouldn’t be reading this blog if you didn’t agree, at least a little bit. Consequently, I’ll ask you to get out a handkerchief and then click on this link that goes to a remarkable video. Be prepared to have your hearts broken, but your spirits uplifted. After you’ve taken a look, click back and I’ve got a couple of things to say about this miraculous endeavor. 1. If your child fits, or you know someone who has a child who fits, here’s a chance for him or her to experience baseball. And what could be better for them? Take a look at their web site. 2. The facility over in Cary amounts to a substantial investment. And the league itself costs quite a bit to run. Consider lending a hand. Cary-based humorist/blogger Cris Cohen is very involved with the Miracle League. So much so that he’s about to publish a collection of his work with the proceeds going to the cause. What the book needs are sponsors. So that’s what I want you to think about. I note that while the League has attracted a huge array of sponsors, surprisingly few are from the world of baseball. So here’s your chance. If you have a connection to anyone in the Triangle baseball community — Durham Bulls, Carolina Mudcats, Duke, UNC, and NC State Baseball Teams, Team USA, Baseball America — take a look and see if you would like to be a sponsor of Cris’ book. Then there’s the folks out of state who look in on this blog from time to time. If you’ve got some kind of connection to baseball and North Carolina, consider chipping in. Who could pass up a chance to prove that baseball really is good for the soul? For aficionados of Carolina barbecue, losing Dillard’s is the most important story of the spring. For the impact on the DBAP, see George Habel’s blog. For a view of the larger impact, check on Bull City Rising. I am not about to divulge my own preferences for barbecue, since that is one of the great theological debates of North Carolina. I don’t have many friends as it is. I’d hate to lose those I’ve got over barbecue. Nor am I willing to divulge my favorite barbecue joint, since there is even less agreement on that topic than there is on barbecue styles hereabouts. I can say that if you want to get a “dialogue” going with newcomers, the opening remark, “What do y’all think about Carolina barbecue?” is the equivalent of pulling the pin on a hand grenade and leaving it in the middle of the table. That said, one would assume that someone will be taking Dillard’s place in the DBAP. Hope so. Barbecue and a beer is a pleasant start to a late afternoon game. As has been abundantly clear over the years, as much as I like stats and charts, I’m not very good at them. On the other hand there are those who dive into numbers and just keep on swimmin’. A good example is this analysis of prospective Durham Bulls first baseman Casey Kotchman by blogger FreeZorrilla. Worth reading both as an exemplar of number-crunching and to let us know a bit about a player we will probably be seeing some of this spring. 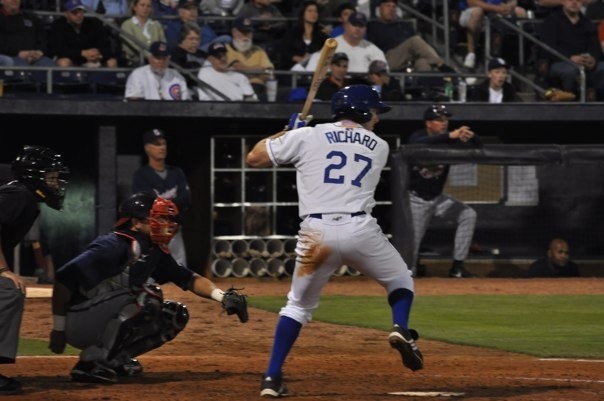 And let me say this just to get ahead of the commenters: Yeah, Chris Richard is probably just as good a glove and probably a better bat than Kotchman. My first response to Tonya Cloyd’s story over on The Life of a Baseball Wife was to ask my wife, “Were we ever that young?” But of course we were. Fun read. Over on RaysProspects they’ve rounded up a bunch of Rays Bloggers to make predictions about players in the Rays system. All posts are worth reading, but this one and this one has players on the lists that we could be seeing this year. In addition, their list of bloggers is a good start for those who want to roam around in the Rays bloggerverse. UPDATE: Just had to add this link from Indy Week about Dillard's. With the recent batch of cuts, we don't have as many players to keep an eye on in the Rays camp. And we are not able to track players once they move over to the minor league camp. This table is sorted by plate appearances and it looks to me like we can safely say that most of these players will not be sticking with the Rays at the beginning of the season. In all likelihood Lobaton and Ashley are there simply because there are still a lot of pitchers in camp and they are only working a couple of innings per game. Plus Chirinos was sent down a few days ago. Things are not looking good for former Bull Ray Olmedo at all. Not sure that he will even make it to the Bulls this year. For the rest, the Rays have at best only one or two slots, the others we are very likely to see in Durham in a couple of weeks. Durham Bulls Broadcaster Neil Solondz puts on a coat and tie, and, taking note of the most recent cuts to the Tampa Bay Roster, talks about how the Bulls roster is shaping up. This is the first year that Neil has done this for us and I certainly appreciate it. Here we are roughly halfway through spring training and folks are speculating about the final makeup of the Rays. As three examples, here are looks from the Tampa Tribune, The St. Petersburg Times, and Rays Index. Which leaves us to revisit the guys we’ve been watching (previous entries here and here). This table is sorted by plate appearances and the numbers come from the Rays stats page. Brandon Guyer has already been sent to minor league camp. If we look at just playing time, we'd guess the bottom several players in the table are due to go next, say from Ray Olmedo on down. Note that Ray’s not having a good spring statistically. At another guess, catchers (Lobaton, Ashley, Chirinos) will hang around as long as the Rays are keeping lots of pitchers on the roster. But please remember that these numbers are really not very good indicators. I mean who’s going to wait to draw a walk and boost his OBP if he’s got a chance to show the boss he can hit home runs? Speaking of home runs, only one player on this list has hit any at all, Robinson Chirinos has two. Update: Five of the players in this chart were “cut” today (15 March) — Jennings, Chirinos, Canzler, Furmaniak, Mayora, and Anderson. Players in minor league camp essentially disappear from media coverage, so we are unlikely to learn much more about individuals until opening day. I’ll do a separate post on all the cuts soon. 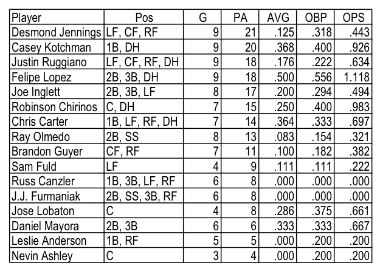 The Rays sent eight players from their spring training roster over to the minor league camp yesterday, seven pitchers and one outfielder. Stories here and here. Of the pitchers four are on the Rays’ 40-man: Bush, Torres, De La Rosa, and Suarez. Thus they are automatically on a short list to move up within the Rays’ system. Brian Baker spent all of 2010 with the Bulls and did a fine job. We saw a little bit of Alex Torres at the end of last season, and he looked pretty good. Left handed batting outfielder Guyer is also on the Rays’ 40-man. He’s had very little playing time with the Rays (7 games, 40 AB, and only 1 hit). Will probably start the season with the Bulls. My guess is that all of the pitchers will start the year in Durham or Montgomery. Two new vendors of pizzas and hot dogs at the DBAP were announced. Although I am essentially agnostic regarding hot dogs, pleased to see a change in pizza vendor. Very pleased to see that a sponsor has continued free admission for active duty military program. Lastly, very good news that Akinori Iwamura is OK. We saw Iwamura in Durham a couple of times in his last year with the Rays. He is now playing for the Rakuten Golden Eagles who are based in Sendai, the town in Japan hammered by yesterday's earthquake and tsunami. At the end of February we set up a players to watch list based on some really simple math. In our first update we cribbed off some of Cork Gaines’ work over at Rays Index. Cork has updated his table based on playing time, but I thought it might be interesting to look at some basic stats. This table is sorted by Plate Appearances (at bats, walks, hit by pitch). Stats are from the Rays website, here. Recently signed infielder Felipe Lopez is having one heck of a Spring. You’ve got to think that injured Elliot Johnson is worried about an infielder job if Lopez keeps this up. Justin Ruggiano is doing OK, but if this article is accurate, there’s not a lot of room for him on the Rays’ roster. 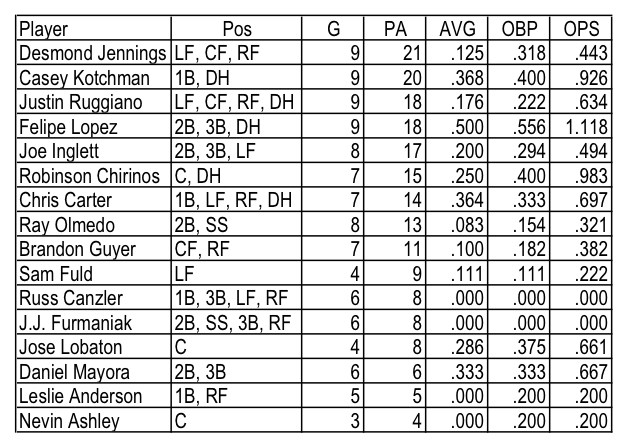 Suddenly, the Rays are pretty well stocked in the outfield behind their projected starters and platoon players. Desmond Jennings, 24, stole 37 bases last year at Durham while hitting .278 and is getting closer. And the Rays added Sam Fuld and Brandon Guyer from the Cubs organization. We Bulls fans really like J.J. Furmaniak. Sure wish he were having a better Spring. Leslie Anderson is getting very little playing time. Sure looks like he’s on the verge of being cut loose. On the other hand this is a really tiny sample and the Rays are doing really poorly as a team this Spring (they’ve only won two games out of ten). Nevertheless, every reason to think that most, if not all, of these players will be in Durham this April. What could be more timely after yesterday’s reset than to have in hand Kevin Gengler’s 2011 Prospect Guide? This is 156 pages of very cool stuff on the 200+ baseball players in the Rays system. What’s more, it’s free! Gotta love those guys over there. Now, to get to the important stuff, what does it have to say about the Durham Bulls? Potential Bulls players are sprinkled throughout the guide with solid profiles (particularly pitching prospects) of the young guys coming up. In addition, he’s got affiliate previews of all the Rays full-season minor league teams. There’s much, much more (page 67) but, really, you should get your own copy. In general, there are some very exciting guys downsystem. This could be a really interesting year. For that matter, RaysProspects is one of those key websites for those who follow the Bulls. Gotta keep an eye on who might be coming along. Watching Durham Bulls Baseball is a place to have a conversation about our favorite team. Major League Spring Training is pretty much in full swing. The Rays have played a few games (not doing too well), but we aren’t going to know much about the Durham Bulls until April. That makes March a good time to “reset” this blog. By “reset” I mean that I’ll sort of start over from where we were about this time last year and not assume any of our readers have been here before. That way I’ll get a chance to re-visit and maybe come to a better understanding of the Bulls, minor league ball, AAA, and stuff such as just what the heck the International League really is. Just for background, this blog started out in early 2009. At the time I really didn’t know all that much about the Bulls, the Rays, or minor league baseball. On the other hand, I figured that I was pretty much like most of the folks in the stands at any given Bulls game. As should have been clear, I also didn’t know much about blogging. Some would say that not much has changed in the last two years. Nevertheless, I wanted to learn more and I knew that the best way to learn something was to try to describe or explain it to someone else. Plus one of the nifty things about the web is that if you don’t know something, there’s someone out there who does. When it comes to the specifics of the Durham Bulls, I am a real newcomer to following the team. After all, I’ve only been going to games regularly for a few years, which makes me by far the junior person (along with my wife) among the regulars in front row of Section 208. They have been a wonderful source of trivia and anecdotes. Looking back I seem to be following a couple of principles. I don’t think I’ll change them much with this reset. Keep the focus on the Bulls and their competitors in the International League as much as possible. That’s another way of saying this is a blog about the Durham Bulls, not the Tampa Bay Rays. Don’t worry too much about being wrong ... and don’t get upset when someone tells you that you are. The business of minor league baseball can be more than a little arcane. Explain if you must, but don’t let it get in the way of the game. I sat down this morning intending to just do a bit of web-surfing. Then I was going to go out and do a bit of yard work before taking a shower and going over to Durham for a look at the Fanfest. But then I ran across Adam Sobsey’s story in Indy Week and now I’m trying to put together a few words about my all-time favorite Durham Bulls baseball player. My hope was that Chris would get a call down to minor league camp as the kind of guy the system needs to steady the youngsters coming up. And it’s not as if the Rays system is overloaded with first basemen anyhow. But, so far, my hope has not been rewarded. I’m guessing that Sobsey has had his article ready to go for a while, waiting to see if a call would happen, and it didn’t. So thank you, Chris, for the thrills you've provided over the years I’ve been watching the Bulls. To mention just the most recent, the fourth inning of last September’s playoff game against Louisville, when you whacked a grand slam to sew up the game. Chris set a bunch of Durham Bulls records. His two grand slams in one game with Durham has to be a highlight. What about retiring number 27, Chris Richard’s number? The Bulls 2011 Fanfest started today (Friday) and will continue tomorrow (11:00 to 2:00). Several days ago I developed a list of players to keep an eye on who are in the Rays Spring Training camp. Now that the Rays have played five games, how are they doing? Well, I was deep into the throes of developing a table for this post when I came across the one that Cork Gaines had already done over on Rays Index. Cork's contention is that you can make some educated guesses simply by taking a look at playing time. Further, playing time in early innings is more important than later innings. So, if you wonder where I've gotten my numbers from, take a look at Cork's work. For our purposes, however, I can narrow the look down to just those players on my initial list. Here's my guess: The fewer innings on this chart, the greater the chances we'll be seeing the ballplayer in Durham this year. Now, here's hoping that Cork updates his chart from time to time. If so, I'll be passing it on. Elliot Johnson has not seen much playing time (only 4 innings) due to a left quad tightness and the Rays have signed RHP Edgar Gonzales to a minor league contract, according to Joe Smith of the St Petersburg Times. This is sort of history, but if you'd like to get an update on what the Rays did in the off season, this is a pretty good summary over at MLB Trade Rumors. For a wife's perspective on Spring Training in Florida or Arizona, check this out.